I love the effect which has been created in these beads. July /August 2007 issue 13 of "Cloth Paper Scissors"
In "Dipped & Delighted" Kelli Perkins invites us to take the Paper Beads we all love making from Common to Extraordinary. She Writes: " From the time we pick up our first crayon to the time we stand and admire our adult handiwork, we are taking the elemental experience of making art with our hands and branding it with our unique presence. There is a comforting simplicity in those crafts learned as children that makes them an ideal launching point for true artistic adventure. Making paper beads can be as simple as rolling construction paper with paste and painting it with nail polish, or as satisfyingly complex as multi-layered wonders that emulate the fanciest lampwork beads." Hunting out my stash of paper beads that I had already made while at college using magazine pages and painted & pearlised papers, I was in my element experimenting & trying out Kelli's suggestions of using paint, embossing powders, seed beads, metallic, threads and wire. These turned out well I thought...Very dramatic! I had to team them up with some Violet Opal crystals to bring out the lilac metallic paper still showing at the top end. Thanks to Kelli for inspiring me to get out those mundane paper beads which I have almost thrown out on more than one occasion. The results are amazing! 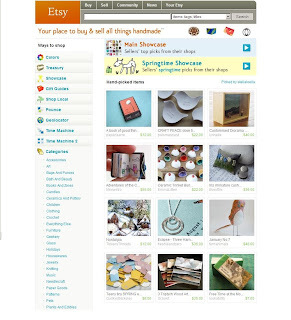 I made Etsy Front Page! 'Inediblejewelry' was kind enough to save and send me a screen shot thank you Jessica you made my day! Im delighted! my ATC & Postcard swap pieces have arrived from Susan Lenz, they are just beautiful. I chose both of these because they were made from the same larger work which Susan compleated for an exhibition in 2004 the original was called 'Last Light Before Vespers' which you can see & read about here be sure to click on the image for an enlarged view...it's a beautiful piece and now I have two little bits of it! The ATC & Postcard I made as swaps for these are shown in post 15th Feb & if you want to see a little of how they came about see post for 14th Feb. If you havent been to visit 'Cyber Fyber' yet to trade why not have a look you might see something still up for swaps. I have been working on Dotee Doll 2 again. I needed to get over the creative block I was having with her. Pinks of course and a flower bead...I like her better now! Following on from yesterdays post showing my fun with fabric crayons, here are two of the fabric pieces which I have worked on & finished. Both of these pieces are now on their way to Susan Lenz and are my swap pieces in exchange for an ATC & Postcard from the 'Cyber Fyber' exhibition. I'm delighted to be taking part and looking forward to seeing my swap pieces from Susan. Postcard fabric piece was overlayed with organza & machine stitched with a variety of colours. Hand embroidery and beads were then applied. I added some stamps and angelina fibers to the ATC and overlaid with chiffon and machine stitched. Hand embroidery and buttons were then applied. Click on the picture for a closer look. It's been a long time since I had my crayons out! I bought these fabric transfer crayons while I was doing my C&G Embroidery at college. I had a lot of fun with them then but had forgotton how much! This is a little watercolour painting I bought in Prague a few years ago. The vibrant colours just jumped out at me when I saw it for sale on the artists board by the river and just had to have it. Now to cut it all up! Two ATC sized ones......& still some left over....only blue sky pieces so I made a 3rd ATC sized piece with them. These pieces are just the begining..... now to get my scrap bag and threads out! What a fantastic workshop! I had such a great day & learned a lot. My sewing machine is not the best for free machine embroidery, I didnt have a darning foot and after Judy kindly let me try her darning foot on my machine I could already see the difference it would make. Even though lacking a darning foot limited me, I was still working on the parts that I could on the day, building up ideas in my head of how I would continue at home once I had found myself a darning foot for my machine. I found a great little foot on ebay the next day which promptly arrived first thing on the Tuesday morning...wow! I cant believe I have gone so long without this little attachment!On Tuesday 4th evening meeting everyone brought in their bags. Some of us have finished some still working on them. It was wonderful to see how each one was so different and unique! As you can see there another 4 foot.....16x10....yippee! I have pictures of more things that I have made and will post these later today, if not then tomorrow. I want to write more about them and I dont have time now. Im off to collect my mum and bring her to Fife for the day. I wanted a gentle looking face and I think it works but the more I look at this Dotee doll No two. I dont think she is finished she needs more....... dont you think? I might work on her some more. I think more embelishment around her face might be what's missing. I'll post another picture when I get more done. My third one has a lot more beading on her and I think its what making me look at this one again and its saying More! more! Finally got a picture of Dotee number two. I used the same fabric as I did for my first Dotee but there was more pink in this piece. So I highlighted with pink beads and flowers. I coloured her cheeks a little with Prismacolor pencil and gave her some soft pink lips. These little dolls are so much fun Im already on my 3rd! My summerhouse workshop has now been ordered! I cant wait to have all that space to stitch and bead and paint and sew and create!